Interested in drawing, illustration and being creative? Aged 7-10? Then this is the course for you! Each week we experient with a different technique / topic such as drawing, animals, colour, stories and image making. This 6 week course is designed to develop both practical art skills and creative approaches in a positive, supportive environment. Delivered by a fully qualified and experienced art tutor. Places are limited to 10 and booking is required to secure place.All materials are provided including a complementary sketchbook to record all your wonderful work. Hi, my name is Jennie and I started Outline Arts in April 2018. I deliver courses, workshops and events in Visual Communication for children and adults. 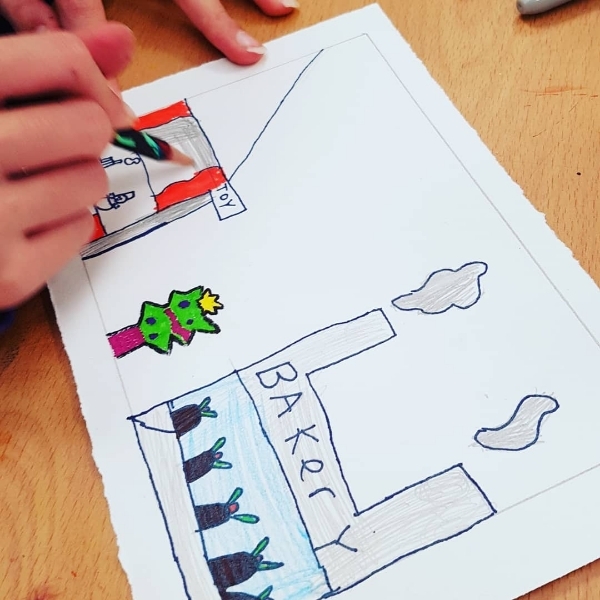 My children's programme includes an art club for children aged 4-14 ( Art Club Minis 4-6, Art Club Juniors 7-10, Art Club 11-14), monthly themed workshops (Age 7-14) and holiday art schools (Age 7-14). I also collaborate with online children's book shop Little Folk Tales where we deliver a workshop inspired by a book and includes a reading, discussion on the story and creation of original artwork. I also run a monthly drink and draw session called, 'I can't draw' for adults and more courses coming soon in 2019.